Product categories of Grill Pan, we are specialized manufacturers from China, Grill Pan, Ceramic Grill Pan suppliers/factory, wholesale high-quality products of Grill Pan Fry Pan R & D and manufacturing, we have the perfect after-sales service and technical support. Look forward to your cooperation! A frying pan with a series of parallel ridges used for cooking food with radiant heat on a stovetop, or with a metal grid in it. This is referred to as a "griddle pan" in the UK and Ireland. See Grill (cooking). 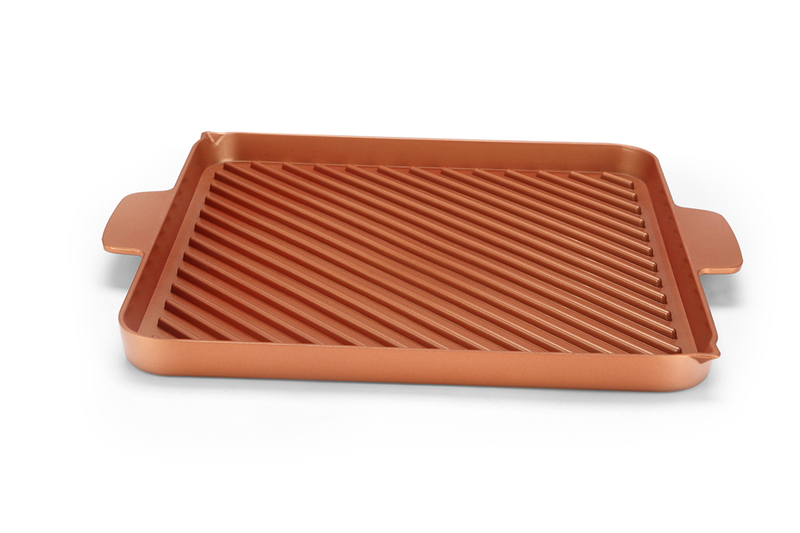 A pan with a raised grill insert, used for cooking food under the grill part of a cooker. This is referred to as a "broiler pan" in the US and Canada. See grilling.